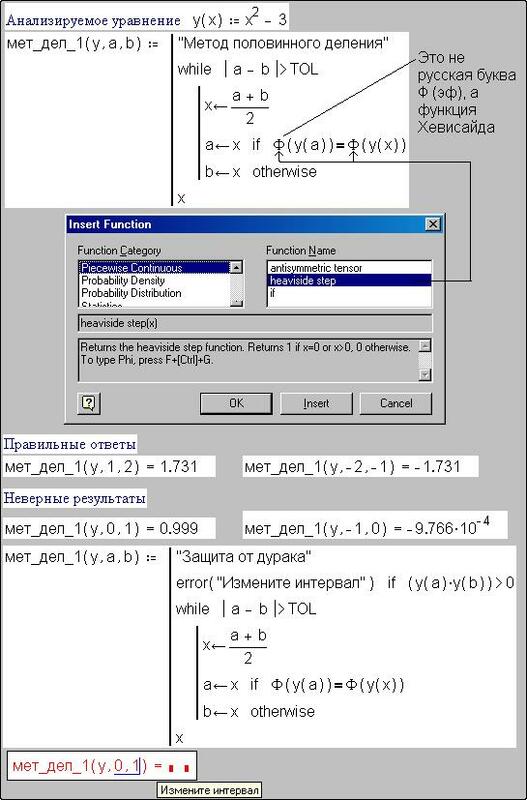 Author will tell you about peculiarities of Mathcad as a remake in his seventh part of the etude. Why is it the remake? At first we have to look through the preface. For the second file with the text «Turbo Pascal 7.0. View from the side» (Computer Press, № 7’93) is kept. This article is the remake. For the third in Mathcad, like in Pascal, there are some aged dogmas of structural programming. This article was written about it. All these things make our remake simple, useful and natural. So, it is the remake. We try to show on simple examples that enter in Mathcad of the operators break, continue and return (see above) is only one step for increasing the flexibility of control designs of this programming language. At the picture 6.16 there is BASIC-program for finding the root of an algebraic equation by the Newton method (tangents). Why do we begin from BASIC, but our etude is devoted programming language Mathcad? BASIC has universal cycle with middle escaping: Do [...] If ... Then [...] Exit Do [...] Loop, .besides traditional cycles (cycle with preliminary control, cycle with subsequent control, cycle with parameter).This design allows to realize algorithms with natural sequence. About other advantages of this design we will tell later. 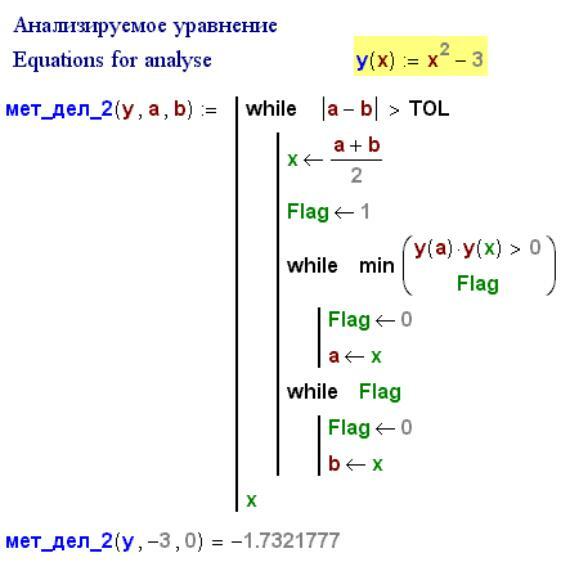 This way at the picture 6.16 the functions of user are declared (we analyze the equation y and its derivative dy), then the value of started approximation of x is asked, and the value of an error TOL. is declared. After it we make the cycle with the middle escaping, but not traditional one. In this cycle, following natural order of the Newton method, new approximate value of the root (x1) is calculated. 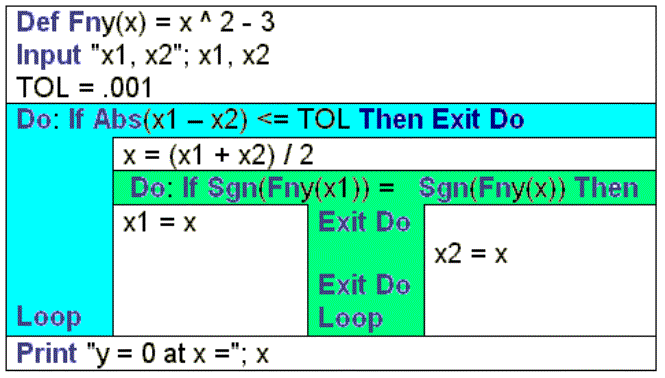 If this value does not differ from previous one more than the value of the given error, (Then) it is considered the problem is solved (Exit Do). Otherwise we prepare next approximation (x = x1), but the cycle repairs (Loop). In Mathcad this simple algorithm gets « architectural extravagances », as since this algorithm is realized by the function and is «packed» to the cycle while. See the picture 6.17. The cycle with preliminary control (the cycle while) requires that Boolean expression of heading was determined before entering the cycle. But it does not take place finding the root by the Newton method. We have to write before entrance the cycle (and for entrance) x1 ¬ x + 2 × TOL. This way someone lies children (but a computer is like a child), making them to do something. Line x1 ¬ x + 2 × TOL is like a starter of an internal-combustion engine, working cyclically. See the picture 6.17. We get a lot of difficulties in such simple problem because in Mathcad there is no cycle with middle escaping. At the picture 6.17 we can notice one more problem in this program: we put a cart at the front of the horse. At first in the cycle we prepare for new approximate (x1 ¬ x), though we do not know if we need it, but only then we enter the cycle. BASIC is the design. Do ... Loop (see the picture 6.16) at the picture 6.18 becomes the design while 1 ...,which can be translated into Latin as «ad calendas greaces». Here, like in the program at the picture 6.17, we have to go on a strained interpretation. Operator continue differs from operator break, that this operator turns over control to the beginning of the cycle. But documentation and help files of Mathcad do not have any examples, justifying using operator continue. Author cannot think out them too. 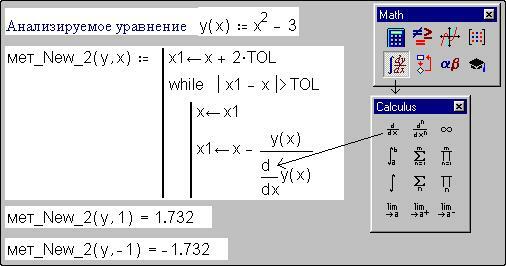 The history about input in Mathcad the operators break and continue and return confirms aged true, that « there is nothing more practical, than the good theory ». Above-mentioned analysis of cycles in Mathcad has both practical and idealized aspect. It is well known that the any set of control designs of any structural language conducts parentage from the basic structural theorem W. Dijkstra. This theorem disclaims any labels: «The algorithm of any difficult we can realized using only the cycle while and alternative ». Author spent a lot of time for proving this theorem in his articles and books, but he did not find anything. But to show that this theorem is not truth we can easily (see the pictures 6.19 and 6.20). These programs solve well-known problem about the root of the algebraic equation. But they do it another method. It is the method of half division. The algorithm of this method is simple illustration of the theorem W. Dijkstra: the cycle (while) is the approximation to the root, where there is alternative (if ... ). If the root is on the right the middle of the interval a-b, then left limit comes nearer (the center) (a ¬ x), otherwise (b ¬ х). In the program at the picture 6.20 the alternative of the program at the picture 6.19 is changed by two cycles while. The operators are executed once or never, that is regulated by the Boolean variable Flag. Besides in the program at the picture 6.20 the cleaning of a cycle is conducted. In the body of this cycle the value of an analyzed function is calculated only once. In the program at the picture 6.19 it was done two times. The second change in the program at the picture 6.21 against the program at the picture 6.19 is we do not use the function Heaviside. The letter Ф is not Greek letter «фи», but it is Russian letter «эф» and one does a mistake. This mistake is found out very difficult, that is why it is difficult corrected. The function Heaviside changes the multiplication of values of the analyzed functions on the limits. Boolean operation And in the program at the picture 6.20 is not called as the function And(..., ...), but the tree-type operator. In similarly BASIC-program (at the picture 6.21 it is put in the structural diagram) we do not use alternative. Moreover, we do not use the variable Flag, changed two cycles while by one cycle. But this cycle is with two middle escaping. One of them is conditional escaping, the other is unconditional one. Locus of the programs at the pictures 6.20 and 6.21 is the alternative. It is the means of accelerated «trip» through the algorithm only to the one direction (top-down and from left to right), but the cycle is a “trip” to two directions. So, we see the alternative is useless (but it only theory, and this alternative is useful in practical aspect). The cycle Do [...] If ... Then [...] Exit Do [...] Loop we can consider an hybrid of the cycle and the alternative. The proof of the theorem W. Dijkstra we can consider that there are no cases, the planned algorithm one can not realize, using only the cycle and the alternative. If the alternative is excluded, then the main structural theorem is: «Algorithm any complexity one can realize, using only the cycle». This theory of input of the operators break, continue and return requires programming language Mathcad. It is the base of Mathcad. The cycle with middle escaping in Mathcad we execute through violence above the cycle while (the picture 6.18). Also we have to write in the title of the cycle some trivial true: «Volga runs into the Caspian sea». The theorem W. Dijkstra we have «to lower in a rank» and to call as a lemma, that is auxiliary theorem, that serves for proving the main theorem. Here we come back to disputes, that took place 30 years ago. The operators break, continue and return, gated in Mathcad, gave us reason to remind about them. These operators have reconciled the supporters and opponents of the GOTO statement to a label. The word «dogma» has as positive as negative meaning. We cannot forget about dogmas during studying or education. One can use other yardstick of closing the cycle: a value of the analyzed function becomes less than a value of the given accuracy. 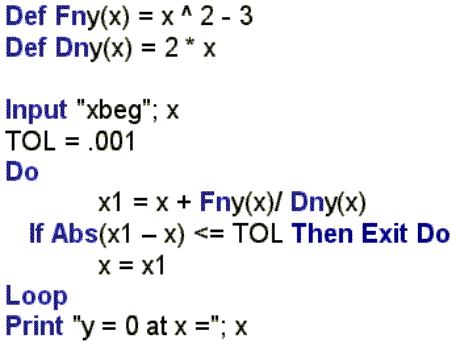 It was done in the document at the picture 6.1 and standard function root is used this method (see the picture 3.1). In the program at the picture 6.18 instead of the operator break we can put in the operator return. This replacement allows to delete last line of the program with indicating local variable. The value of this variable is returned by this program. But we can delete this variable in the program at the picture 6.18 with the operator break. But there is good rule: we do not rely on default (program Mathcad always returns a value of last appropriation), we fix the name of returned variable (compare, please, the ends of the programs at the pictures 6.17 and 6.18). The programmers, who use label never, one can advise to impose on themselves one more the prohibition: to write the program without using the operator if. The programmers have to use only the while and to remember, that the alternative with one shoulder is the cycle. The body of this cycle is executed once or never. We tender reader to exclude the operator if from the programs of this book. The examples at the pictures 6.20 and 6.21. Many programmers rank a function call as the basic structural control designs, specially, recursive: the Fibonacci numbers without a recursion can be calculated (the picture. 6.11), and number Аккермана (the picture. 6.13) - is inconvenient to calculate this way.